This video shows the automated processing of cuttings using the Rombomatic robot. The robot is specially designed for decorative plants and trees. It automates the entire planting process including critical judgment of plant quality. ► Stem cuttings from the mother plant are manually placed in clamps. ► The stem cuttings are automatically moved to the robot modules. ► The cuttings pass a camera. ► Using the camera image, the system determines if the cuttings are suitable for further propagation. ► The robot clips the cuttings from the stem. ► The robot plants the cutting at the exact desired angle and direction in a pot or tray. ► Notice where the pots go under mister heads. These heads can be used to apply the rooting solutions by the Spray Drip Down® Method. ► The robot acts like an expert in the greenhouse. ► All cuttings are properly prepared. 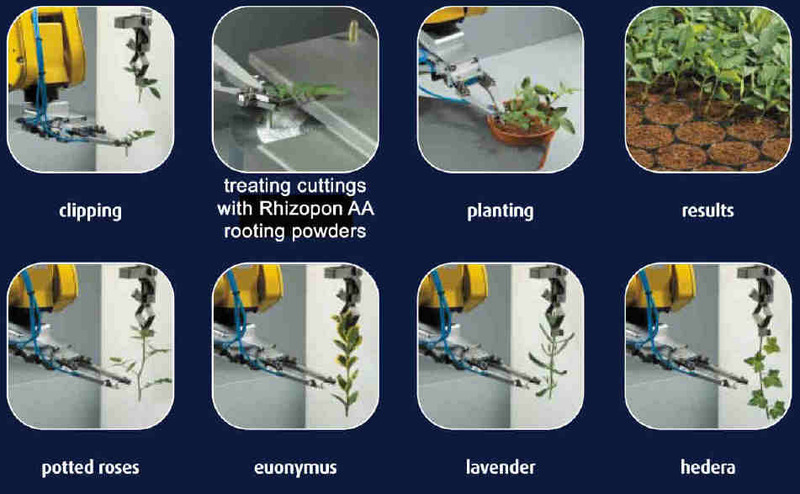 ► The Rhizopon AA rooting hormone powders are uniformly applied to all the cuttings.